If you are anything like me, this time of year your recycling bin is overflowing with cardboard boxes from various deliveries of Christmas gifts for various family and friends. Seeing all that cardboard makes me itch to do something creative and so I decided to make a few Christmas Wreaths with Dan Jon Jr, despite the both of us still being slightly scared of making anything craft based together. I found a bowl that was about the right size I envisioned and used it to trace around on the cardboard for the outside of the wreaths. 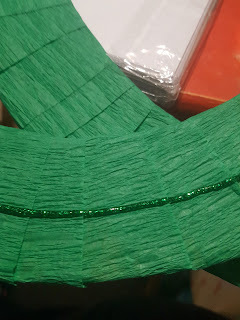 I found a slightly smaller bowl to make the middle of the wreaths and using a Steak knife because I couldn't find my pen knife or craft knife, cut through the thin cardboard. 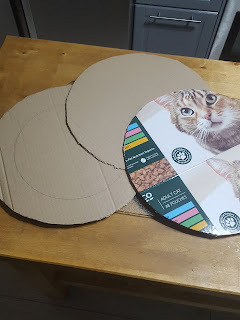 As you can see, I also found an old Cat Food Box useful to making a wreath ring from, which just goes to show that all those times Blue Peter told us to use Cereal Boxes and the like, they were on to a winner! 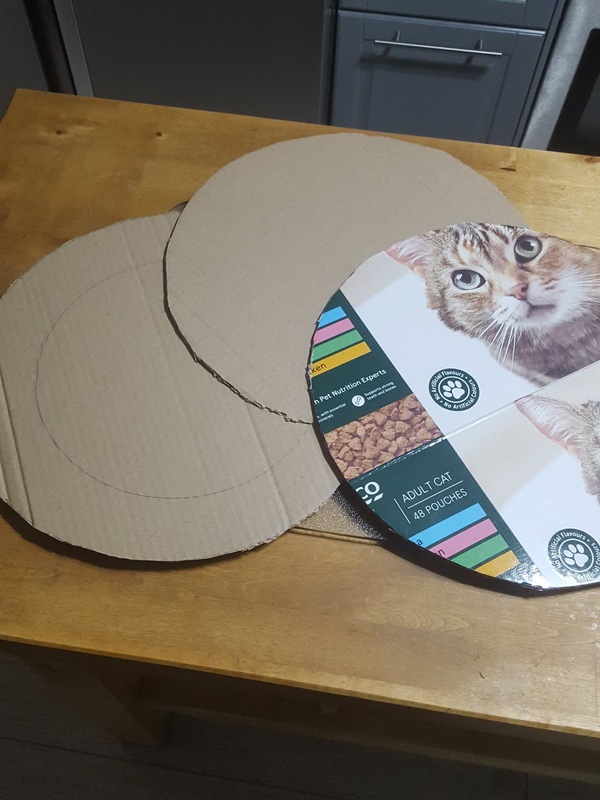 After cutting the circles out I started wrapping crepe paper around the cardboard wreaths. I used a small amount of sellotape to keep the crepe paper in place and wound and wound and wound. Dan Jon did actually help at this point and commented it was rather like making a giant pompom, but he soon got bored of the neat winding! 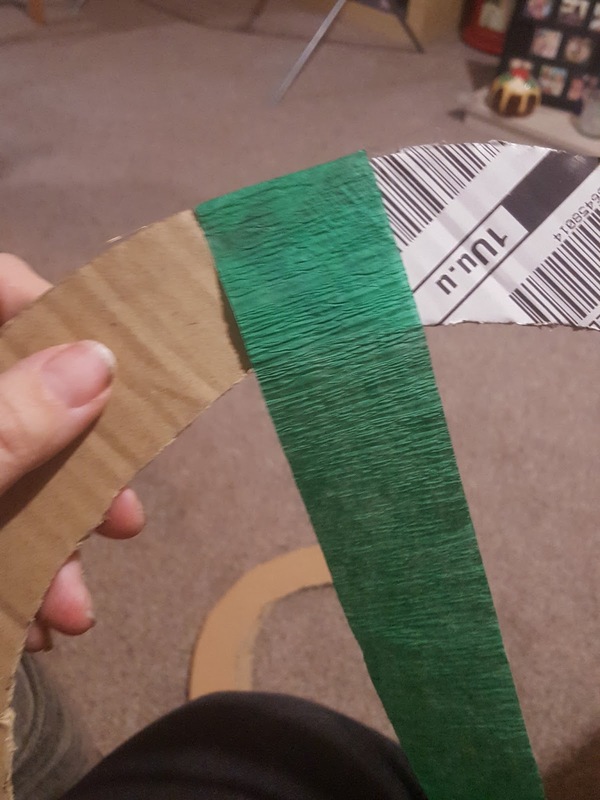 I wasn't sure if the rings were going to be sturdy enough if I just wound around once, so I wound a couple of extra times around the thinner cardboard rings, but they were really sturdy so I'm not sure I needed to! One thing I didn't picture (I only have two hands!) was rippling a further strip of crepe paper to decorate the wreaths. I simply folded the strip in "waves" until I assumed I had enough! I then measure them against a wreath and had a bit much, but it was okay. 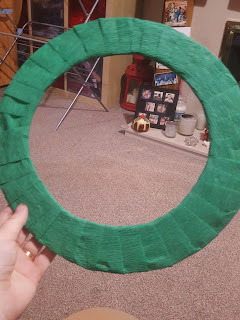 I decided to create an accordion paper for one of the wreaths, by alternately folding the crepe paper together in squares and again measuring around the rings to make sure it was long enough. I then added a circle of green glitter glue to the wreath and stuck the crepe waves or the back of the accordion squares to it. 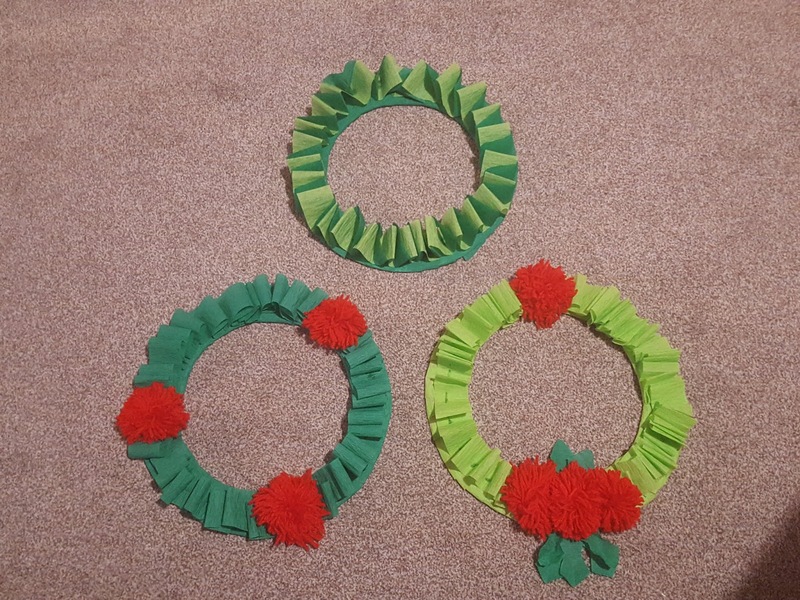 I stuck some pom poms onto two of the wreaths, and added a few crepe leaves to one as a bit of added decoration, as I thought they looked cute. I, rather cleverly, also stuck the pom poms where the wreaths were looking a little like I'd forgotten to evenly spread the waves... I did it on purpose honest! After I was sure the glue was dry, I attached a little string, so I could hang them and am quite happy that they give our home a little bit of DIY Christmas Charm.